Per The Digital Media Law Project: Missouri's wiretapping law is a "one-party consent" law. Missouri makes it a crime to intercept or record any "wire, oral, or electronic communication" unless one party to the conversation consents. In Missouri, you may record a conversation or phone call if you are a party to the conversation or you get prior consent from one party to the conversation, unless you are doing so to commit a criminal or torturous act. Missouri also prohibits the disclosure or use of the contents of any wire communication obtained in violation of this section. Violation of the Missouri law is a class D felony, punishable by imprisonment and fine. In addition to subjecting you to criminal prosecution, violating the Missouri wiretapping law can expose you to a civil lawsuit for damages by an injured party. Data obtained from the Lake of the Ozarks MLS for January 1, 2015 thru July 9, 2018. Frequently in the home buying or selling process, buyers encounter homes whose sellers are offering home warranties. Both buyers and seller (and some agents) are frequently under the impression that these warranties cover most, if not all, costs to repair or replace things that fail in the home. A home warranty is a contractual agreement provided to an owner of a house by any of a number of different types of entities. In the case of this article, I am referring to “home warranty” companies. The home warranty industry was founded in 1971 by American Home Shield. In the strictest legal sense a warranty of any kind must adhere to guidelines set at the states' and federal government's levels. But the word “warranty” is not always used explicitly to mean a legal warranty is being conveyed. Usually, a home warranty is not a warranty at all but rather a home service contract that covers the repair and/or replacement costs of home appliances, plumbing, heating and cooling and electrical systems, and possibly other components. Coverage and costs vary significantly across home warranty companies and home warranty contracts do not cover all home repairs. Some home plans are more expensive and cover more items while others are more limited. Most require that you pay a service fee, around $50 to $100 per incident and also have a maximum amount that they will pay per covered item and a limit on what they will pay in total. Be sure that you are aware of what the coverage exclusions are and if the company pays the full cost of replacing an item or its depreciated value. Most warranty companies have a “Sample” Coverage Terms document that outlines what is included and excluded as well as some other terms. These generally look pretty good. Many have fine (miniscule) print that references a cover/front page that details specific coverage on the particular home. Make sure you have all information before making a decision. One of the best preventive measures you can take to reduce the risk of nasty equipment failure surprise after closing is to schedule a thorough home inspection (by a reputable, knowledgeable company). Your purchase contract should allow for an inspection and have a date by which you must complete and report any issues to the seller. If their response is that the home warranty will cover it, look over the coverage terms AND make a call to the warranty company to verify this. A great resource for home warranty information and reviews of existing companies as well as a list of ones no longer in business (some reportedly still selling warranties) is the website; www.HomeWarrantyReviews.com . A home warranty can be a great asset, you just need to do a little homework to make sure you know as a seller what you are offering and as a buyer what you are receiving. Existing-home sales grew for the second consecutive month in March but lagging inventory levels and affordability constraints kept sales activity below year ago levels, according to the National Association of Realtors (NAR). Total existing home sales, which are completed transactions that include single-family homes, townhomes, condominiums and co-ops, rose 1.1 percent to a seasonally adjusted annual rate of 5.60 million in March from 5.54 million in February. Despite this month's increase, sales are still 1.2 percent below a year ago. Closings in March eked forward despite challenging market conditions in most of the country. Per Lawrence Yun, NAR’s Chief Economist: "Robust gains for March in the Northeast and Midwest – a reversal from the weather-impacted declines seen in February – helped overall sales activity rise to its strongest pace since last November at 5.72 million," said Yun. "The unwelcoming news is that while the healthy economy is generating sustained interest in buying a home this spring, sales are lagging year ago levels because supply is woefully low and home prices keep climbing above what some would-be buyers can afford." The median existing-home price for all housing types in March was $250,400, up 5.8 percent from March 2017 ($236,600). March's price increase marks the 73rd straight month of year-over-year gains. In the Midwest, existing-home sales increased 5.7 percent to an annual rate of 1.29 million in March, but are still 1.5 percent below a year ago. The median price in the Midwest was $192,200, up 5.1 percent from a year ago. Properties typically stayed on the market for 30 days in March, which is down from 37 days in February and 34 days a year ago. Fifty percent of homes sold in March were on the market for less than a month. Throughout the country markets are seeing the seasonal ramp-up in buyer demand this spring but without the commensurate increase in new listings coming onto the market. As a result, competition is swift, and homes are going under contract in roughly a month, which is four days faster than last year and 17 days faster than March 2016. Spring was slow in it’s arrival this year and although sales have continued to be strong I feel that the market was diminished by the late appearance. Many of the sellers I work with were reluctant to get their homes ready for the season and on the market before the wet weather let up. The lake real estate inventory is still tight, and this has contributed to what I feel would have been an even stronger first quarter. A five-year comparison of first quarter sales shows continual increase each year over year with few exceptions. The following data shows the sales in only the first quarter of each year. 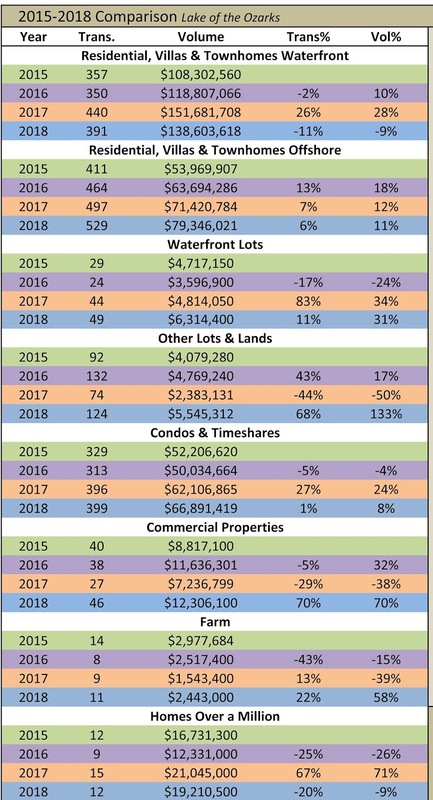 Lakefront homes sold in 2018 totaled 267. This is down slightly from 2017 which had 278 sales. Sales in 2016 were 202. Sales in 2015 were 196. 2014 sales were 181. Non-lakefront home sales in 2018 were 199. This category of homes has continued to increase in sales each year. 2017 sales were 186. 2016 sales were 181. 2015 sales were 152. 2014 sales were 139. Condo sales have also increased each year. 2018 sales were 147. 2017 sales were 131. 2016 sales were 111. 2015 sales were 77. 2014 sales were 76. Lakefront lot sales are coming on strong compared to previous years. 27 lots sold in the first quarter of 2018. Last year, in 2017 we had 18 sales. 2016 sales were 9. 2015 sales were 13. 2014 sales were 12. Low inventory and, finally, the strong buyer demand, is driving sales prices up as well as bringing the lakefront lot market back. If you are intent on selling, I feel that 2018 and 2019 will continue to be a Seller’s market. My advice to buyers is to be on top of the properties coming on the market either via a real estate agent or an online property database. When a property that is well priced in conjunction with its condition becomes available, it is very common for it to be under contract within a week of coming on the market. If you are intent on buying, you need to be positioned to know as soon as a property meeting your criteria is offered. You will also need to be ready to view the property and make a strong offer. Price is not the only items you need to consider when making an offer. Earnest money, financing, inspection and other contingency times and closing date are just a few items to consider. Sales data obtained from the Lake of the Ozarks MLS comparing the time frame from January 1st to March 31st, 2014 – 2018. 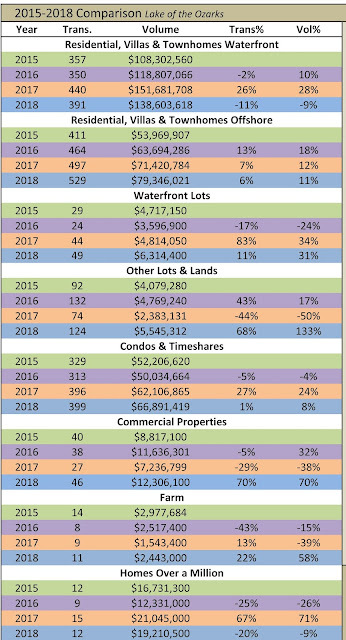 Following is a chart showing the breakdown of lakefront homes sold in 2017 by area. Sales were widespread throughout the area and across a wide range of prices. The total number of lakefront homes sold in 2017 was 950, this includes 10 that are not on the chart due to being located in areas outside of our main service areas. The average square footage was 2350 and the average sales price was $335,141. The median sales price was $260,000. Currently on the market at the beginning of 2018 are 455 lakefront homes with an average square footage of 2903 and an average list price of $531,412. The median list price is $349,350. Sales data obtained from the Lake of the Ozarks MLS covering the time frame from January 1, 2017 to December 31, 2017.